The Ribbon of Rings Bracelet is my original design that was inspired by those wonderful ribbons you see in the fabric stores, lying on the counter in swirls and whirls of color. 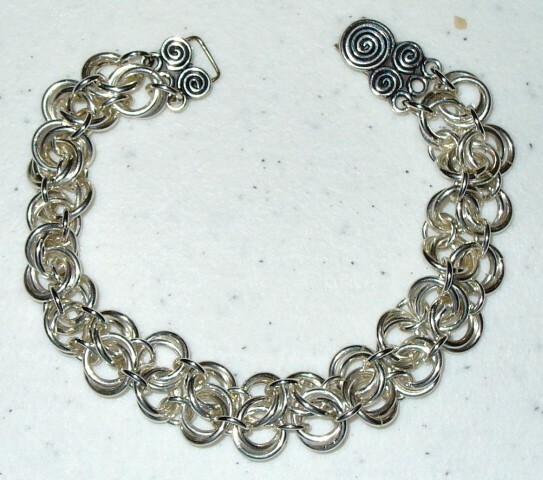 This was my way of transforming the flow of the fabric ribbon into a chain mail bracelet. It gives the visual image of a living, flowing ribbon, with the substance of a solid sterling or yellow gold filled piece. It is an intermediate weave. The clasp is not included in the kit.